To be or not to be the best picture, that is the question. I’ve always viewed a “best picture” winner as a movie with a great original screenplay, amazing characters, a larger than life epic, or something unique that possibly we’ve never seen in a movie before. Obviously, Hamlet, being one of William Shakespeare’s greatest plays, is a well-known story with more memorable lines than I had remembered. But is it a best picture? – I’m not so sure. The film was produced in England so it may be the first film we’ve watched that would be considered a “foreign” film. However, I don’t believe this would unique enough to qualify for best picture. The black and white production is atmospheric but stark and at times visually harsh. Similarly, the musical score I felt was overly melodramatic and distracting. Laurence Olivier, often considered one of the greatest Shakespearean actors, did win the Oscar for best actor and that is an award that is well deserved. He even proved to be an excellent swordsman. Is something rotten in Hollywood? I wouldn’t go that far but Hamlet is definitely not one of my favorite films. Good night sweet prince – on to 1949. Hamlet is a take on William Shakespeare’s classic play that Sir Laurence Olivier directed and starred in. The film won Sir Laurence Olivier two Oscars- one for his acting and one for best picture due to his producing role in the production of the film. Olivier also appeared in an earlier best picture winner, 1940’s Rebecca directed by Alfred Hitchcock. 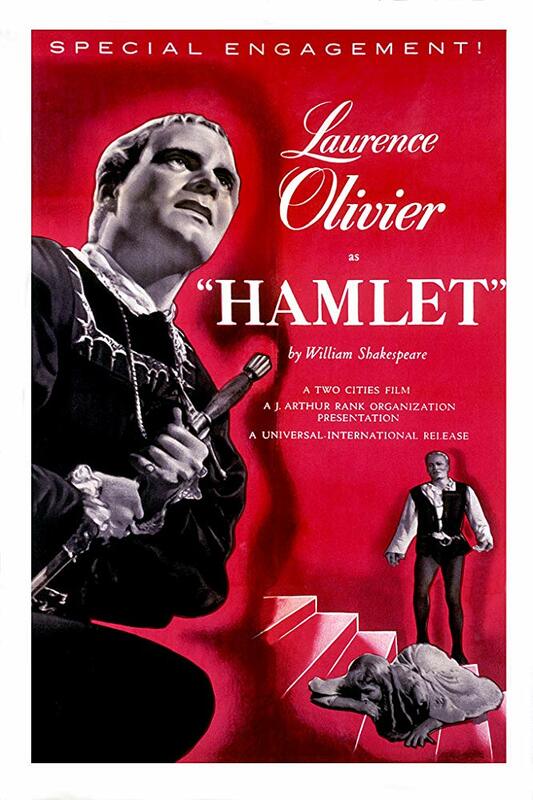 Hamlet was the second film that Olivier directed and his second Shakespearean adaptation. Olivier is considered one of the greatest actors of the 20th century and this version of Hamlet is considered his seminal work. Olivier was the first film actor to be elevated to peerage (knighted) for his work in film by the queen. While Olivier obtained four Oscars during his long and prolific career, Hamlet is the only film for which he won a best actor award. Olivier’s other Oscars besides the two for Hamlet, came from a special award for his work on his first film, Henry V, and a lifetime achievement award given to the knighted actor in 1978. Hamlet is also the first film that we have reviewed where the director was also the leading actor in the film. While Olivier did not win the directing award, his achievement of directing a best picture where he also won best actor clearly solidifies his place in the annuls of Oscar history. While the previous two films we have viewed from the 1940’s dealt with the post-war malaise in American culture and the despicable rise of anti-Semitism in America in the 1940’s, Hamlet pivots away from reality and takes a stab at the escapist entertainment of the golden age of Hollywood. This import marked the first non-American film to win best picture and was the first film version of Hamlet to include sound. There have been seven post-war versions of Hamlet including this 1948 version, “Grigori Kozintsev‘s 1964 Russian adaptation; a film of the John Gielgud-directed 1964 Broadway production, Richard Burton’s Hamlet, which played limited engagements that same year; Tony Richardson‘s 1969 version (the first in color), Franco Zeffirelli‘s 1990 version starring Mel Gibson; Kenneth Branagh‘s full-text 1996 version; and Michael Almereyda‘s 2000 modernization starring Ethan Hawke”. While I had seen a few of the other aforementioned adaptations, this was my first time watching this 1948 version. While many of the shots in this depiction of Hamlet seem staged like the theatrical production, it takes the introduction of phantasmagoria to become more abstract. Using close-up angles and fog, Olivier symbolizes the arrival of Hamlet’s father’s ghost. The special effects in the film held up well to modern standards in most scenes, with only the shots of the entire castle suffering from a lack of CGI or expensive budget. On a somewhat related note, the voice of his father’s ghost coming from the helmet of his armor reminded me of how George Lucas styled Darth Vader in Star Wars. Perhaps Lucas drew inspiration from this Olivier film. Without writing too much of a book report on Hamlet, whose plot and subject matter is some of the most well-known in the entire cannon of English literature, I will instead focus on the cinematic elements. This cerebral story, with many soliloquies and internal dialogue, has a tendency to drag a bit. With limited action for periods of time, the movie is largely saved by the peaks of action including flashes of violence and emotion. The acting is superb at parts, but does show flourishes of melodrama typical of earlier films. Additionally, the sometimes dragging moments are disrupted by the hits of the Shakespearean dialogue with a performance of the “To Be or Not to Be” Monologue delivered with Olivier’s incredible acting chops. Besides Olivier, the real star of this film is the soundtrack. Between the brilliant score played by the orchestra, the sound effects in the form of heartbeats and gusty corridors add tremendously to moments of introspection and eeriness. Overall, I found Hamlet to be a very traditional yet innovative portrayal of Shakespeare’s source material. While the play was cut down to deliver a film 2.5 hours long, it still captured the major action and dialogue for which Hamlet is known. In full honesty, Shakespearean English is not my favorite and watching this film was a little bit of a chore. Fortunately, there were sword fights and murder to break up the dense dialogue. Unfortunately, the film ceases to cross the line from cinema to entertainment for my particular tastes. Olivier’s performance and direction breathed life into the already dramatic story and the themes of betrayal and loss are timeless motifs that will remain relevant for all time. Additionally, in comparison to other best pictures which we have viewed throughout our journey, this film seemed to do much less to acknowledge the new realities facing post-WWII Europe/America. While Hamlet is clearly a classical work, it’s hard to pivot from groundbreaking commentaries on antisemitism, treatment veterans returning after WWII and alcoholism that represented the subject matter of our last three entries. I also preferred the films, The Red Shoes and The Treasure of the Sierra Madre which were both better films than Hamlet in the best picture category that year. With that said, in order to truly enjoy this film you really need to commit with both of your love of literature as well as the melodramatic style of 1940’s cinema.